Despite his proclamation of innocence, police have filed a murder charge against trailer-truck driver Surapon “Aof” Darakham, 23, over the July 19 death of 19-year-old Nareekan Yawiraj, deputy national police chief Srivara Ransibrahmanakul said yesterday. The charge would stick, thanks to incriminating evidence and witnesses’ testimony, Srivara said, although the evidence so far allegedly incriminated only Surapon. If the suspect implicated anyone as accomplices, police would also summon them for questioning. “This case is not an accident, but a murder,” he added. Srivara said the Ayutthaya Police had set up a fact-finding panel to probe an allegation, raised by Help Crime Victims Club’s president and lawyer Achariya Rueangrattanapong, that police investigators had allegedly accepted Bt300,000 to treat the death as an accident. Achariya publicly claimed that Nareekan might have been sexually and physically assaulted before her death. That led two women to step forward to claim they had also been attacked by Surapon in similar circumstances. They said they accepted a ride from Surapon after he duped them into getting drunk but were instead raped at a hotel. Central Investigation Bureau chief Pol Lt-General Thitirat Nongharnpitak yesterday interviewed the two women. 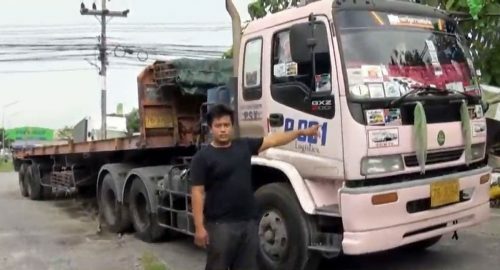 Surapon, who was initially charged for detention by police at Bang Pa-in Police Station, had claimed that Nareekan sustained fatal injuries after she jumped out of his moving truck in Ayutthaya’s Bang Pa-in district while he was giving her a ride home following a night out. Besides Surapon, Nareekan’s friend Sirinat Robram, 18, and her boyfriend, who has been identified only as “Top”, were also charged for abetting in the detention of Nareerat. Sirinat is now in custody but “Top” remains at large. Those three and Nareekan had been hanging out together at an entertainment venue before the events that led to Nareekan’s death. Line chat records show Nareekan had expressed intense fear while being a passenger in Surapon’s truck. She was later found with serious injuries at a hospital in Ayutthaya. A post mortem found that Nareekan has died of injuries caused by a blunt object to her head. Meanwhile, the Help Crime Victims Club yesterday issued a statement on its Facebook page calling for the Crime Suppression Division and neutral police to take over the case. There was a need to ensure transparency in a probe against the Bang Pa-in superintendent and subordinates over alleged negligence of duty, and to provide protection to the witnesses, the statement said. The family also intended to take the victim’s body to a rally outside the Provincial Police Region 1 office today in their call for justice, the club’s post said.